Firstly, please accept my apologies if I haven’t commented on your blogs for the past week or so but we drove down into Spain/Catalonia for a break while my daughters house/dog/cat sat and, as one daughter doesn’t live here permanently, we’ve also been having some family time and I’ve been keeping off the screen and sewing machine as much as possible. Mlle. Tialys the Elder is here for another week but I just dropped in quickly with an update on the F2F third block swap organised by Kate. 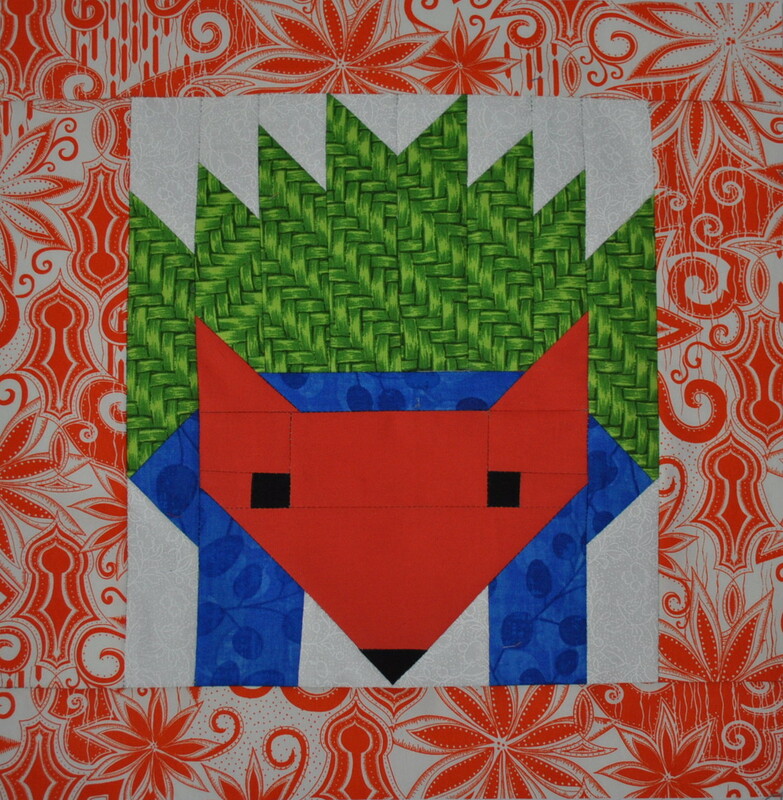 During the 2016/2017 swap, I discovered the pattern for Elizabeth Hartman’s Fancy Forest quilt and made a couple of blocks featuring her foxes and also two hedgehogs because they were easily made into the correct size for the finished blocks (12 inches) that this block swap calls for simply by adding a border. 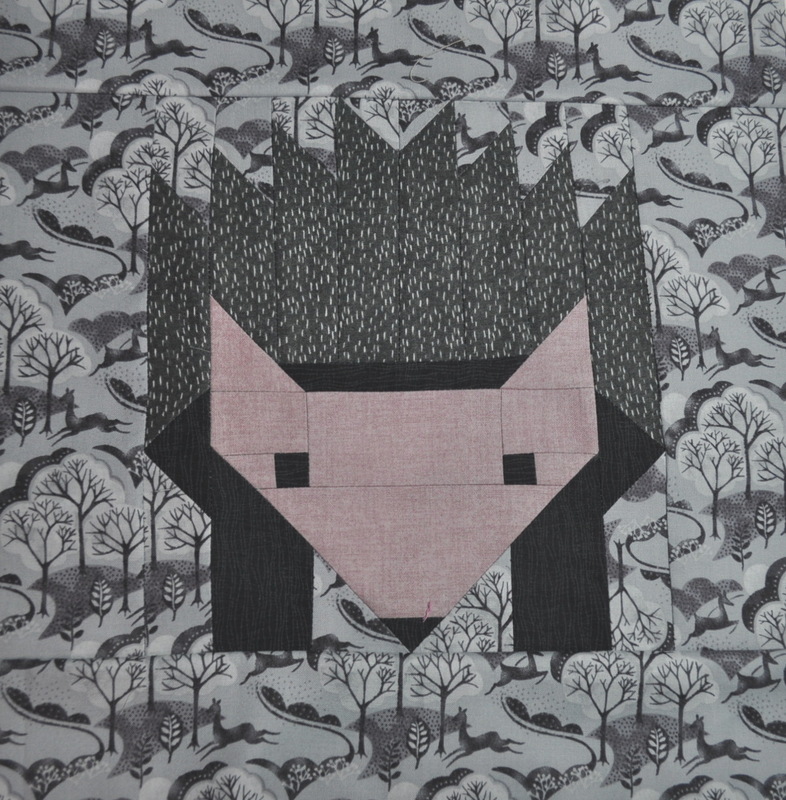 It was interesting matching the colours they had chosen for their quilts to the pieces of hedgehog and each one is unique – I can guarantee you won’t see any of these in the wild. 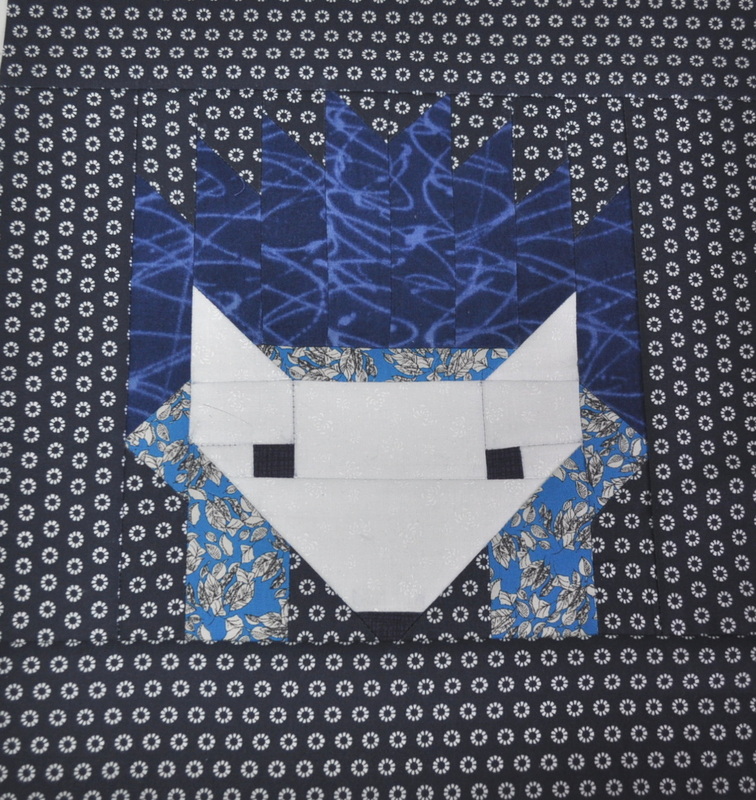 I couldn’t resist revisiting this pattern for this year’s swap and – bearing in mind the participants who have already received one and the fact that not everybody might like a hedgehog in their quilt (although I can’t imagine why not 😉 ) – I made this blue and white one for Sue over in Washington as one of her three blocks for July. I’d never made one for myself so, not to be left out, I made one in the neutral colour palette I’d selected as my colour choice this time round. 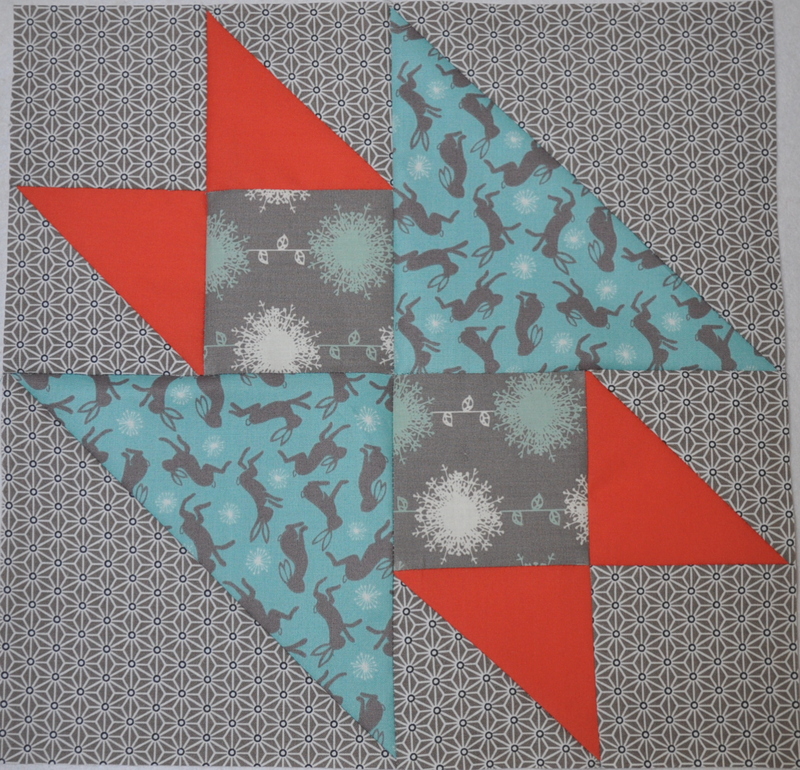 Plus, a paper pieced favourite of mine called ‘Banded Star’ – a pattern you can find free on Craftsy here. With the receipt of these brilliantly executed (though not brilliantly photographed) blocks from Moira ……. I now have all my blocks here and ready to be assembled into one big beautiful quilt or, quite possibly, two smaller fabulous throws. I chose a neutral palette so that I could display them in the living areas of the house more easily so two smaller ones would make sense. 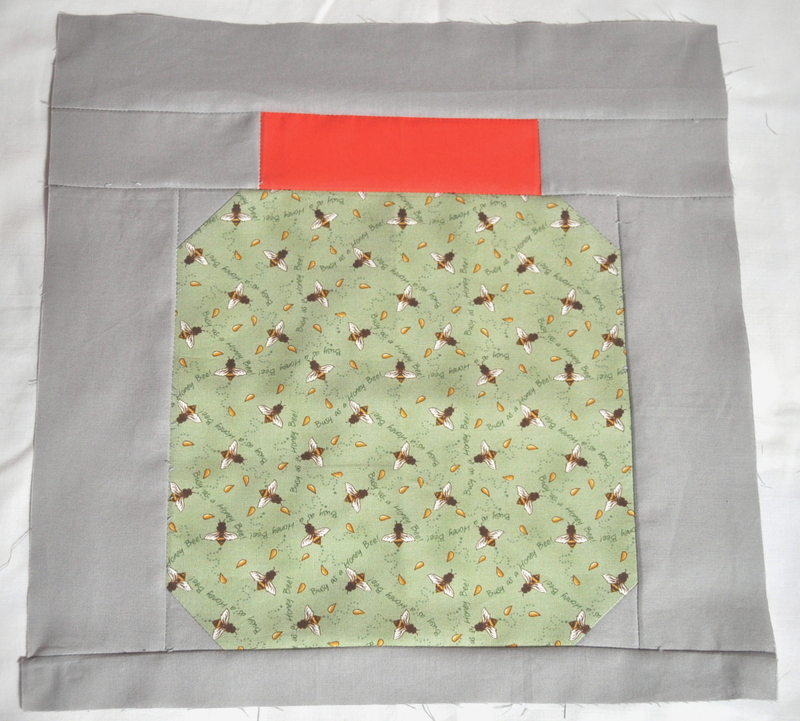 As usual, with sampler quilts, I will probably QAYG (quilt as you go) and might even have a go at hand quilting this time so you probably won’t see the finished article any time soon but it’s time I tried to improve my quilting skills and this will be an ideal project to do so. Expect minimalism! I mentioned my tentative foray into block swapping in an earlier post. 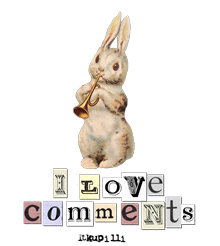 It has been organised by Kate over at Tall Tales From Chiconia and Sue From The Magpies Nest and involves twelve people from all over the World. It’s called Foot²Freestyle because each block will have a finished size of 12 inches or a foot, clever eh? Every month it is the turn of one of the twelve participants to receive three blocks from each of the other eleven participants so there will be eleven parcels to open. It’s my turn in October – I’m excited! 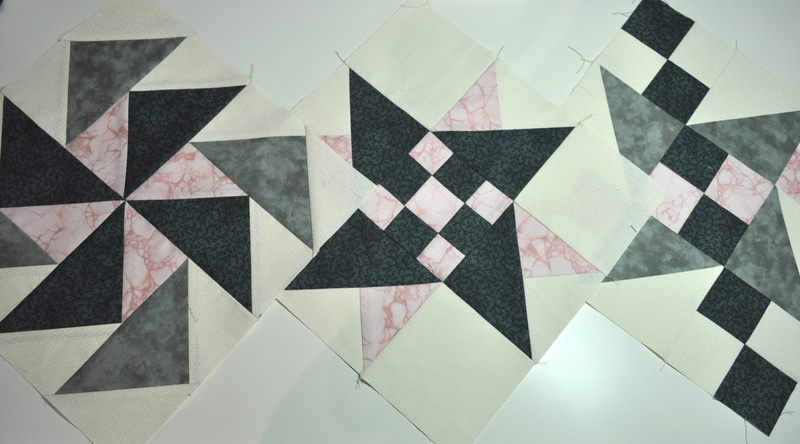 I also have to make three blocks of my own, making 36 big blocks with which to make a 72 inch square quilt. Bearing in mind the year long fabric fast I have just started, it is lucky that everybody chose their colours right at the beginning of the swap so I think I have enough fabric to make all the remaining blocks between now June 2016. I have made the blocks for Miss September which is Sue, one of the organisers, she’s asked for black and white with a ‘hot’ colour of our choice, but I can’t show photographs of them yet as it will spoil the surprise when she opens her package. 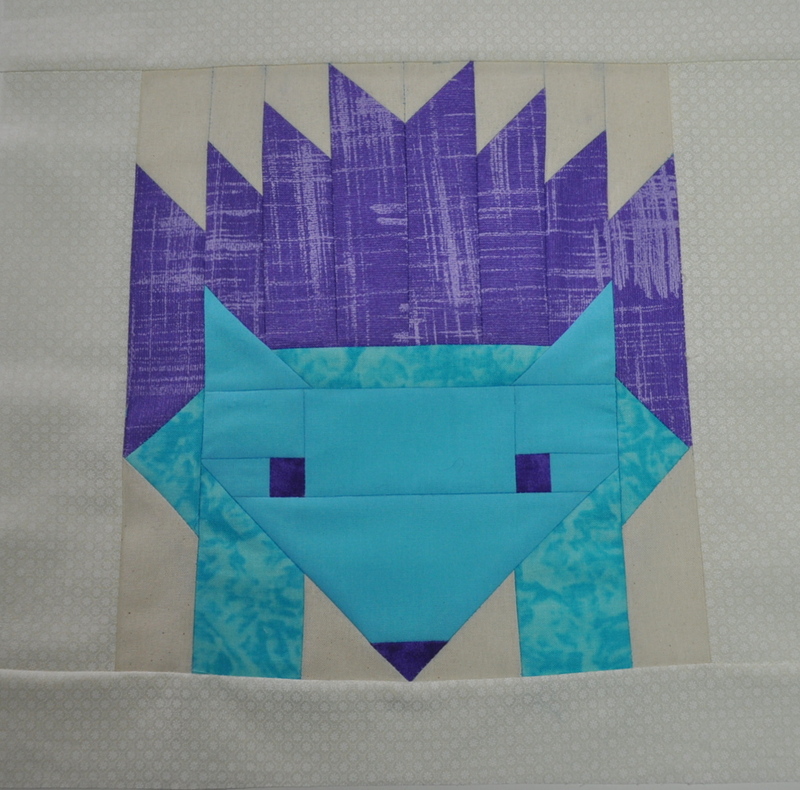 I’ve made the three for my own quilt so I’ll show the photos of those instead. 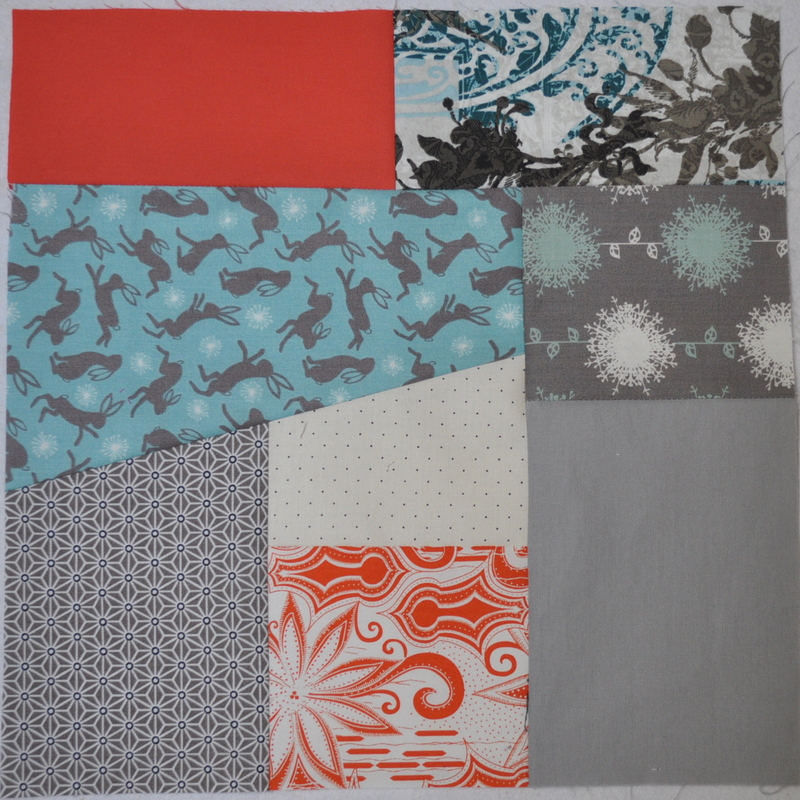 The colours I chose were dark grey, with light grey, white, turquoise and touches of coral or orange. Rabbits not obligatory! 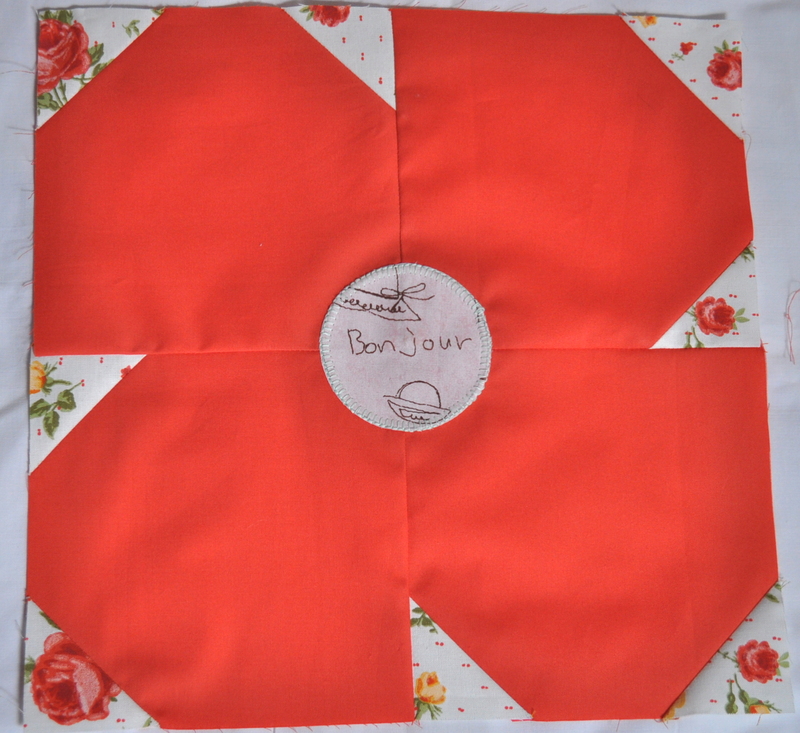 I said earlier that I made a ‘tentative foray’ into the world of block swaps and that is because, although I’ve been doing patchwork on and off for years, some of the others have made it into an art form and seem to make a quilt a week. Therefore, I decided to concentrate on colours and fabrics and keep the designs simple. Mind you, even then, I seem to cut off points and go ‘wonky’ from time to time. I’ll never win any prizes but I’m enjoying it. 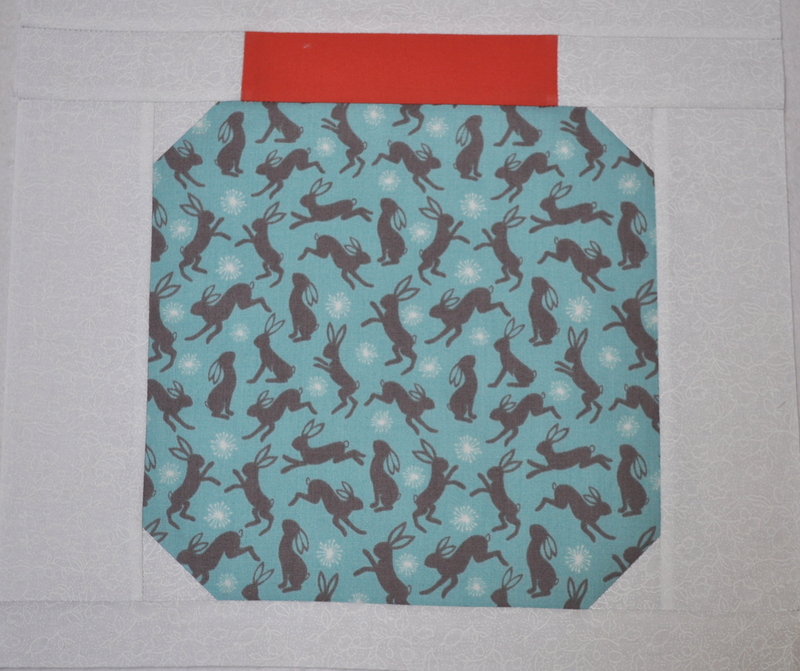 The bug jar above is a fun design, I think and bottling rabbits is a little different to the usual spiders, etc. 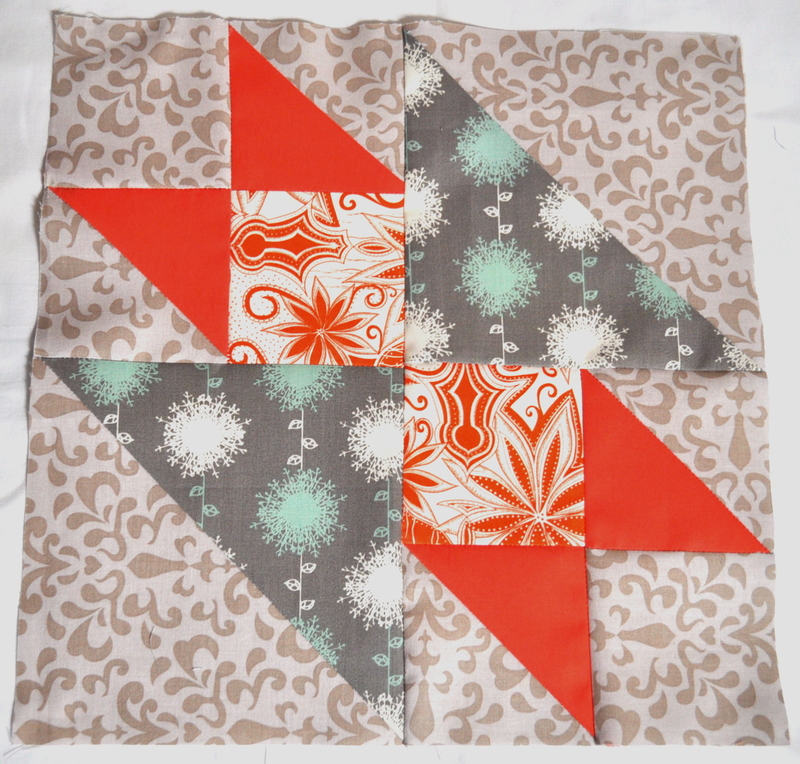 Some years ago I made a faux ‘crazy’ quilt using this block. It’s supposed to look as if it’s been randomly pieced but actually there are three pieces cut with a template and the rest by measurement and they are then joined together to make a block. 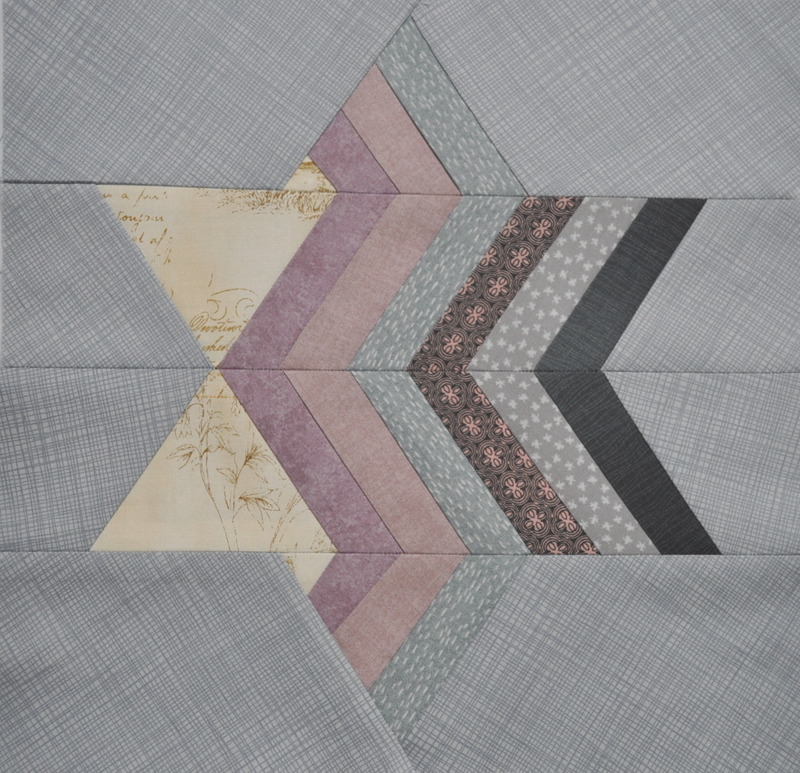 In this way, you can achieve a random looking quilt by mixing up the fabrics used for each piece and turning the block around so that the total effect looks ‘crazy’. I like the anvil block because it has points, but not too many, and I’ve been making a few of these so I’m managing to keep more of the points in the actual design now! The grey patterned fabric in the background will be featuring quite heavily in the near future and the reason for that will be revealed in a future post. However, the words ‘I’m never bothering to make a dress again’ might give you a clue what the subject matter will be. Actually, now I’m looking again, I think those little feet are pink but you get my drift.